One of my favourite childhood stories was "Three Little Kittens" - It was so sad when they all lost their mittens and their mommy said they couldn't have any pie! Meow, meow, meow! It's such a cute little story and easy for little kids to both read along and memorize like our kids do. Our friends at Thomas Allen & Son sent over some great kids books for us to take a look at. We'll be sharing those in future posts! 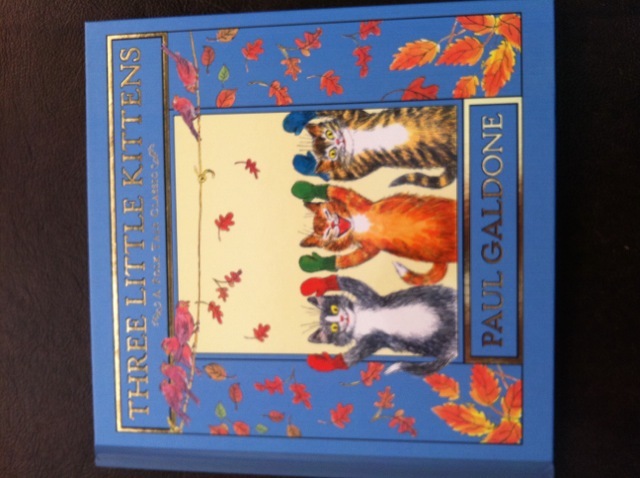 One of the books in the package was of course "Three Little Kittens" illustrated by Paul Galdone. K was very delighted because she said they frequently read that book in class and she always wanted to have her own copy, well now she does. This version is worded basically the same way as the original beloved family folktale we all remember and the illustrations are quirky and brilliant. This particular book can be found at Chapters or Amazon. Three Little Kittens is a wonderful, classic folktale story we are proud to add to our ever-growing library of books! Posted by AME on behalf of Thomas, Allen & Son. Samples are received for review purposes. Comments and opinions on this blog are those of the author.